PA students get real-world experience at the maurices Community Clinic. Classes for the College's new Physician Assistant program began this past fall, starting an initiative that is expected to have a significant positive impact on health care across the region within just two years. Students who complete the two-year program will receive a master's degree in PA Studies. This fall's cohort contains 30 students; that number will increase to 34 and 38 students in the next two years. The program was developed through collaboration with health care providers across the region to meet workforce demands, said director Kim Kruger, M.D. "As health care costs rise and the number of physicians declines, the demand for non-physician health care providers has boomed," Kruger said. "Our graduates will help fill this acute need, particularly in rural communities, where physicians are especially scarce. According to the Bureau of Labor Statistics, employment for PAs is expected to increase by 30 percent nationwide by 2024. "St. Scholastica is perfectly poised to deliver a great program in a brand-new building with access to quality clinical health systems and experienced health care educators who are excited to share their knowledge." Incoming student Jen Jensen is excited about being a part of the inaugural cohort. "There's something to be said about being the first class in a new program," said Jensen, a 2013 pre-med graduate from St. Cloud State. She had met several PAs while job-shadowing with doctors and surgeons, and was intrigued by the career path. Originally from Rogers, MN, Jensen was familiar with St. Scholastica's reputation from friends who had gone through the Occupational Therapy program. "Scholastica has an amazing program for everything else," she said. She was impressed by the lab facilities in the Health Science Center as well as the PA faculty members. "We have such talented people teaching us," she said. As a former college athlete who is married to a professional hockey player, Jensen has an interest in orthopedic medicine. But cardiology fascinates her as well, and she loves the adrenaline rush of emergency medicine. Her diverse interests make the PA program - where students learn to serve in a variety of areas instead of specializing in one - all the more appealing, she said. She's also looking forward to a fast-paced, challenging curriculum, and the chance to gain real-world clinical experience after just one year of taking classes. In developing the program, PA faculty and staff worked closely with an advisory board, which played a key role in the accreditation process. Comprised of a wide array of community partners who meet twice a year, the group will serve as an ongoing resource to ensure that the program is meeting its mission and taking advantage of opportunities for collaboration. The majority of graduates from St. Scholastica's program are expected to practice in the five-state region, primarily in Minnesota and Wisconsin and in underserved urban or rural settings where the need for trained professionals is greatest. The innovative curriculum uses high-tech classrooms and medical simulation software. Students will work with clients in the Health Science Center's maurices Community Clinic, made possible through a generous gift from maurices. 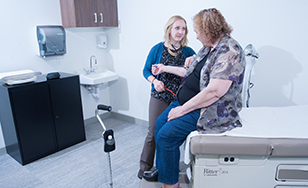 The clinic offers physical and occupational therapy services to people with little or no insurance, and to the St. Scholastica community. Care is supervised by program faculty. The clinic offers invaluable interprofessional educational experiences. St. Scholastica students will collaborate with students in UMD's Pharmacy program and the Lake Superior College Physical Therapy Assistant program. "This kind of team approach is the future of medicine," Kruger said. "This is one more way in which our PA program is on the leading edge of preparing health care professionals."